Glamping, a fusion of glamour and camping, is becoming more and more popular in Japan. As a way of enjoying outdoor activities without giving up on the comfort, it has seen many facilities pop up all over Japan offering unique experiences. 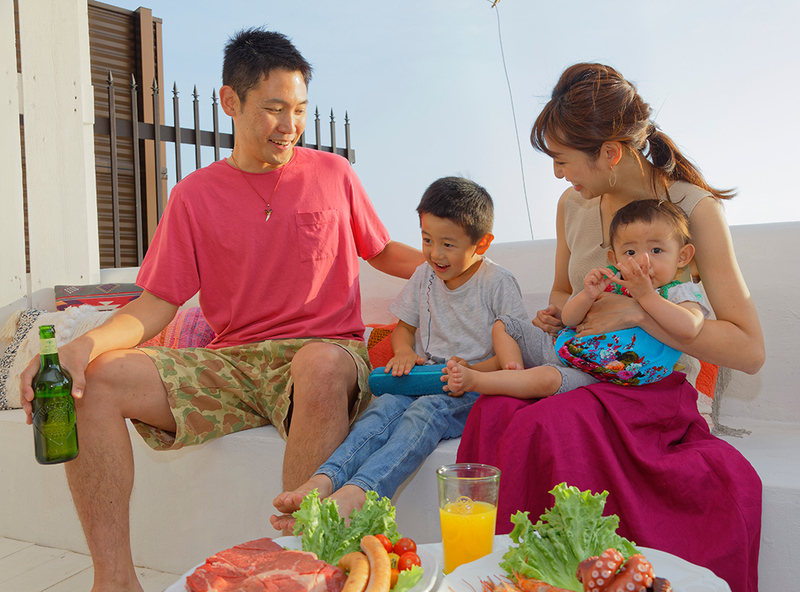 In this two-part series we'll follow a young Japanese family while they enjoy a luxury weekend on the beaches of Hayama. 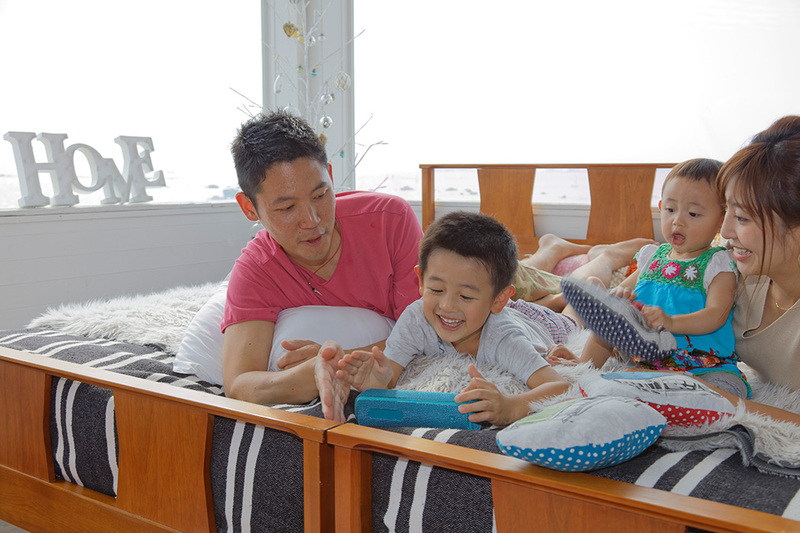 On their first day they brought with them Sony's new Portable Wireless BLUETOOTH® Speaker SRS-XB21. Shohei and Emi are an energetic young couple with two beautiful children. Take, 5 years old, and little Shi-chan, who is just about to celebrate her first birthday. Living and working in Tokyo, they decided to spend a couple of days away from the big city and venture in some fun outdoor activities by the sea. 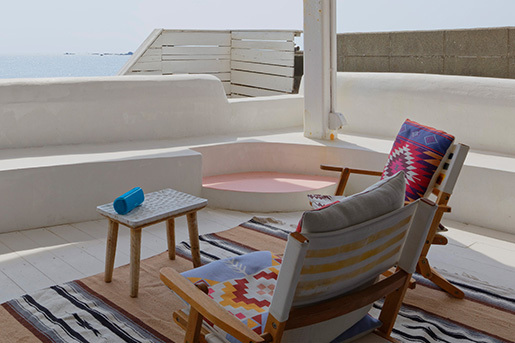 THE HOUSE on the beach is a stunning two-story residence overlooking the beach in Hayama, Kanagawa Prefecture. 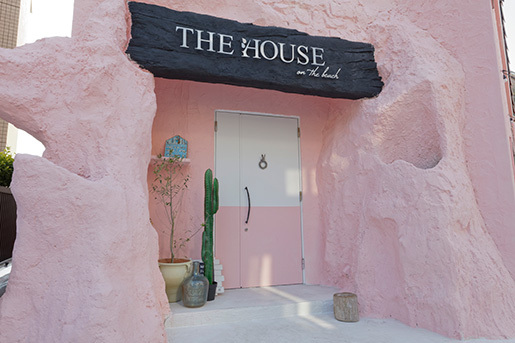 The interior is bright and spacious and it features an open terrace with a Jacuzzi bath tub. You can access the beach directly from the terrace! The plan for the day was barbecue, playing in the sea and lots of music. 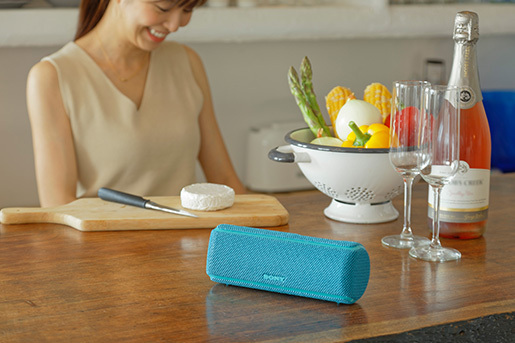 Let's see how the family enjoyed the wireless speaker. After settling down in the house it's time to get some music going. 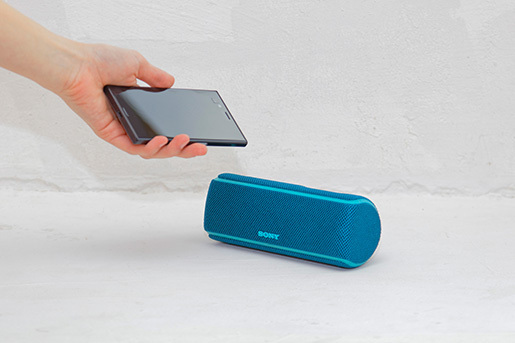 Pairing the speaker with a device is simple and quick thanks to the Bluetooth® (*1) technology and NFC™ (Near-field communication) (*2). Once the speaker is connected you can instantly play any audio. 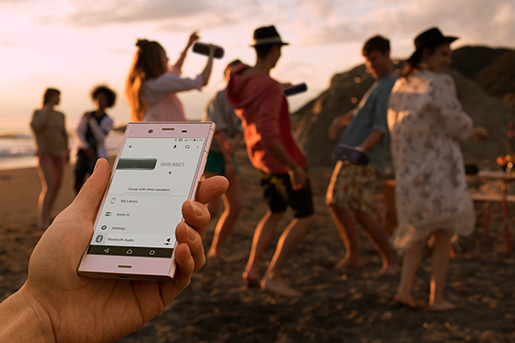 Using the Sony Music Center app you can also control the speaker's sound modes, equalizing and lighting patterns. - The connected device needs to support A2DP (Advanced Audio Distribution Profile) Bluetooth. - Supports SCMS-T content protection. - Depending on the connected device, connection environment and usage conditions, noise interference or sound interruption might occur. - When viewing movies using the Speaker Add and Party Chain modes, a delay might occur between video and audio. - Smartphones that support NFC connection are required. - Some smartphones may require installation of the NFC Easy Connect app. 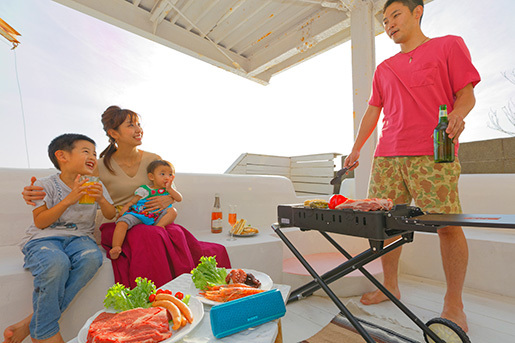 First they relaxed to some music while preparing the food, then the family got together in the sunny terrace to grill some meat. The SRS-XB21 has a LIVE SOUND mode that sends the sound to a wider area for an immersive music experience. Everyone enjoyed the barbecue feeling like they were listening to a live concert. When the Party Booster mode is on, tapping the speaker will make various drum sounds to accompany the music. Four different surfaces will give you different sounds: a scratch, snare, kick drum and cowbell. The volume of the sounds changes depending on how hard you tap the speaker. Also, using the Sony Music Center app you can choose from 15 different sounds. Take was instantly enthralled by this new way of listening to music and he had a blast. The SRS-XB21 is waterproof so Take was able to take it with him for a walk along the beach. It's ok for it to get wet even with sea water! 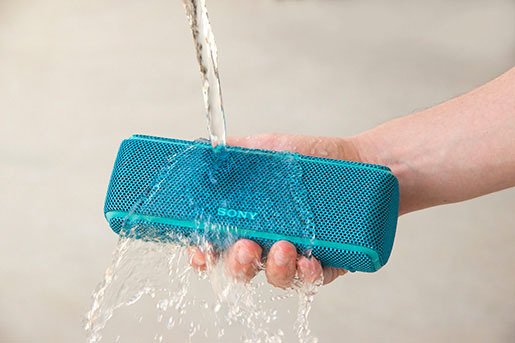 The speaker is also rustproof and dustproof, making it good for taking outdoors in general. And if it gets dirty you can just rinse it with water. - This product can be immersed in 1m deep water for up to 30 minutes without being damaged (IPX7 rated). - Protected so that dust of diameter of 75 μm or more does not enter the product (IP6X rated). 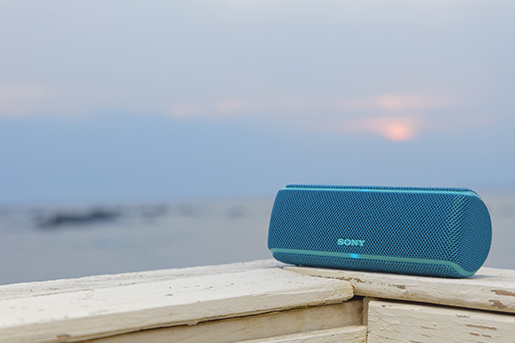 What's better than waking up to a gorgeous sea view, with a soothing tune that sets the mood for the day? The first thing Take did the following morning was turning on the SRS-XB21, and the speaker can keep playing all day long thanks to the long battery life. When lighting is off in Standard mode. The battery life time may differ due to the surrounding temperature and usage conditions. When connected through Bluetooth. By factory default, this device is set to EXTRA BASS mode. The SRS-XB21 allows you to listen to your favorite music everywhere you are, providing an immersive and interactive experience. Being waterproof, dustproof and rustproof make it the perfect companion for trips, camping and outdoor activities. The commands are simple and intuitive and the connection quick. Try it for yourself and bring your favorite music everywhere! *Machine translation is available for this website.